I need your help, I can't any solutions on the web ! Hi LH, i can't resolve my problem !!! 1. Open Command Prompt and "Run as Administrator"
Espace du volume de stockage de cliché instantané utilisé : 168.672 MB. Espace du volume de cliché instantané alloué : 299.746 MB. Espace du volume de stockage de cliché instantané utilisé : 8.959 GB. Espace du volume de cliché instantané alloué : 9.182 GB. Espace du volume de stockage de cliché instantané utilisé : 8.881 GB. Espace du volume de cliché instantané alloué : 9.111 GB. Espace du volume de stockage de cliché instantané utilisé : 323.734 MB. Espace du volume de cliché instantané alloué : 562.625 MB.
) has no drive letter associated to it. Do you have any idea what that could be?. 2. What is on volumes D: and E: - right now shadows are being written on those too, but that may not be neccessary. 3. C:, which is probably your appr. 65GB OS partition, looks normal. If you could also post a snip of your "Computer" window (in Tiles view), that would help. What do you mean with a snip ??? The first volume is an reserved space Acer, this volume is unavailable , it contains some initializing files of Acer. So, I hope that's the good one ! C'est n'est pas mal. Malheureusement ca ne montre pas le bon affichage (TILES en Anglais). Ce que je cherchais etait le nombre total d'octees et le nombre libre - Comme sur mon example. OK, that's good. Your disk partitions look good. I had suspected a squeeze for free space, but that is not the case. In the meantime I have studied a few German websites where they were discussing the same problem. Unfortunately nobody had found a solution - but they all suspected the Anti Malware program - especially McAfee. Which is your security program? And now what's the next step ? I am not sure what the cause of the problem is. For a test, I suggest to turn the system restore for D: and E: off (where it is really not needed). 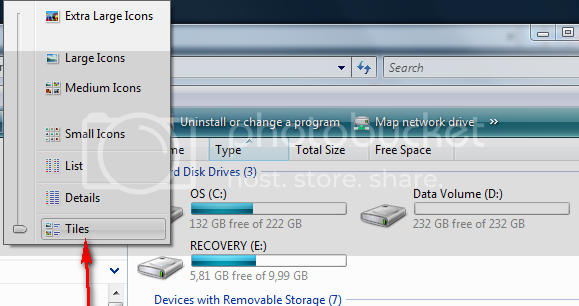 Sytem restore only makes sense for the OS disk partition. To turn it off, you go to the Backup and Restore Center, then in the left pane to " Create a restore point and change settings", then you wait a couple of minutes until it found the data and check off the boxes for D: and E: followed by APPLY. I made what you said, but I see no difference ! My laptop runs very good, no problem but the messages always appears !